Confetti Hair Studio and Wellness Spa uses high quality, professional products for our beauty salon and spa services for men and women at affordable prices and our professional staff are licensed and consistently educated to ensure you have a memorable experience with us. For your convenience we are located on Main Street in Scranton Pennsylvania. We will continue to offer new developments in beauty salon and spa services as we learn about new products and services through literature, expos and seminars. 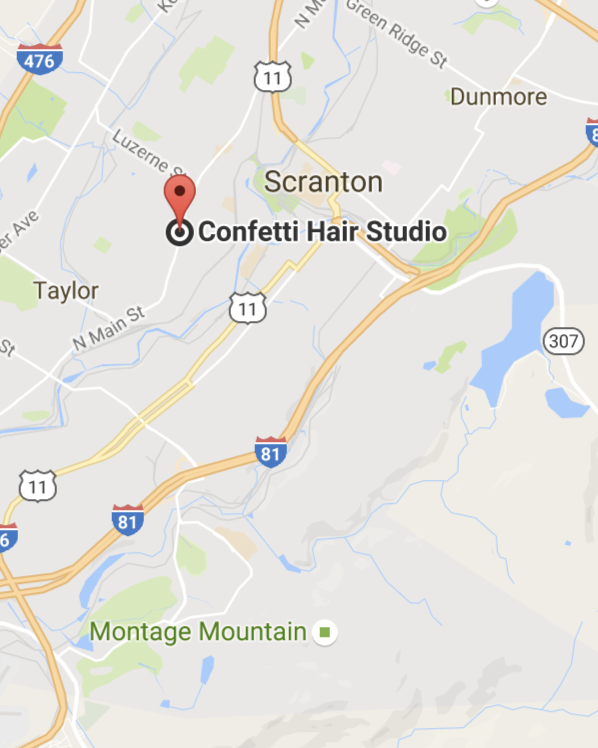 Tips for a Wonderful Experience at Confetti Hair Studio and Wellness Spa…. Our services are available by appointment only on a daily basis. We recommend calling as far in advance as possible to ensure availability of your preferred stylist and/or spa technician. We also recommend that you schedule your next appointment prior to leaving our facility. A credit card will be required to guarantee reservations for spa services and packages. Reserved appointments require a 12 hour advance notice to our reservationists for rescheduling/cancellation. A 24 hour cancellation notice is required for groups of two or more. Cancellation of an appointment in less than the specified time will result in a fee of fifty percent of the services scheduled. All “NO SHOWS” are charged at full value of the services scheduled. Please arrange to arrive at least 15 minutes prior to your appointment. This will allow you time for check in, prepare for your service and receive the full length of your treatment. Unfortunately, clients arriving after their schedule appointment time will not receive an extension of services and will be responsible for full service fees. All treatments must end at the schedule time, as to prevent the delay of the next client’s services. Gift certificates may be purchased in exchange for services and products* and may be purchased for a specific dollar amount, individual service or spa package and are valid for up to one year from the date of purchase. Gift Certificates are not transferable, refundable or redeemable for cash; however, they may be exchanged for other services and products at face value. Please present your gift certificate upon check-in. Taxes and Gratuity are not included. Consider the experience for a special customer or employee reward or as part of a company retreat. Call 570-346-3999 for information or assistance with the coordination of your special event. Receive 10% off any series of 6 or 12 massage or facial services. Series must be purchased as a package to receive the discount. If you are pregnant, have heart or circulatory problems, or diabetes please avoid all heat treatments. We ask that you inform your spa technician of any medical conditions you may have so that we can provide you with the best treatments for you. Upon arrival for our spa services you will receive a robe, sandals and a locker. Please keep your locker key with you at all times. We are not responsible for any lost or stolen items. If desired, undergarments or a swimsuit may be worn during treatments, however, our technicians are trained to discreetly drape and provide you with complete privacy at all times. At any time prior to your treatment, please discuss any adjustments that your technician may make for your comfort. We are here for you; please let us know how to make you comfortable. Our goal is to provide a relaxing and tranquil atmosphere; therefore, please maintain a quiet level of conversation. Out of consideration for our guests, please mute pagers and refrain from cell phone and other electronic device use in the spa area. Only clients receiving spa services will be allowed in the spa area. To ensure a healthy environment for our clients, smoking is not permitted. To allow a more pleasant visit for yourself and others, please make arrangements for small children. Children are not allowed past reception area unless having services. Children under 16 years of age must be accompanied by an adult.